Kevin Durant has been interacting with fans a lot more lately, and it’s not just from a burner account on Twitter this time around. 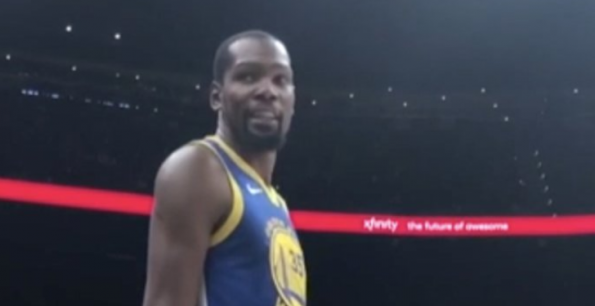 A few weeks ago, the Golden State Warriors superstar was caught on film walking over to a Dallas Mavericks fan and cursed them out for heckling him. He got fined for that one. On Monday, the Warriors were in Atlanta taking on the Hawks when KD was getting set to inbound the ball, so he turned around and told some fans to ‘watch the game and shut up.” He smiled saying it this time, so it’s unlikely he’ll receive a fine from the league.